HANOVER, Mass. 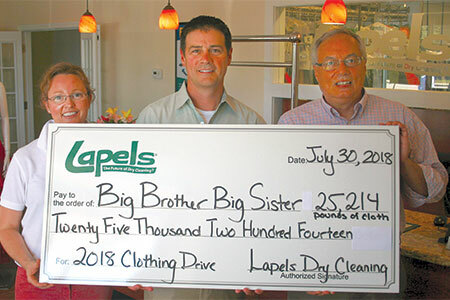 — Lapels Dry Cleaning notes that its 15th annual clothing drive to benefit the Big Brother Big Sister Foundation (BBBSF) generated 25,214 pounds of clothes donated, with its store in Marshfield, Mass., leading the way with more than 15,000 pounds of clothing donations alone. “We can’t thank our franchise owners across the country enough, and of course our customer base, for helping us to give back to the Big Brother Big Sister Foundation,” says Kevin Dubois, owner. “Being a part of the local communities we serve is a big part of the Lapels difference. This national campaign really gives us an opportunity to make a difference in the lives of the children in the communities we serve,” he says. The company’s stores in Arizona, Connecticut, Massachusetts, Michigan, Missouri and New Jersey participated in the drive, which started on April 7 and ended on Earth Day, April 22, the firm notes. More than three dozen locations contributed to the drive. Within its network, the drycleaning franchise challenges its individual stores to be the largest collector of garments and awards prizes to the franchise owner with the largest amount of donations. This year’s winner was Kimberly Wilkinson, owner of Lapels Dry Cleaning of Marshfield, Mass., who was able to donate more than 15,000 pounds of garments to BBBSF, the company notes. Part of that 15,000 came from Wilkinson and her team volunteering to clean and dry many of the garments discarded at the start line of the Boston Marathon. With this year’s heavy rains at the start of the race, the cleaners writes, there was a need for someone to help to maintain the integrity of those garments. Wilkinson and her crew sprung into action, cleaning truck loads full of clothes at a moment’s notice. “The clothing that came in from the Marathon was in really tough shape. It truly is a testament to the way Lapels Dry Cleaning locations clean clothes that we were able to salvage clothes from that day so that the BBBSF could use them for resale,” says Wilkinson, who, besides Marshfield, also owns stores in Cohasset and Kingston, both in Massachusetts. The clothing collected is now being sold by high-end thrift stores, the cleaner points out. The net proceeds from these sales are donated to BBBSF mentoring programs for young girls and boys in participating states. Items typically donated, it notes, include: men’s, women’s and children’s clothing; and coats, jackets, and shoes (any season or size). Household items donated include: linens, sheets, blankets, towels, drapes, comforters, afghans, curtains, and fabric, and purses were also accepted. “We can’t thank Lapels enough for their efforts in putting together this record-setting clothing drive,” says Beck.